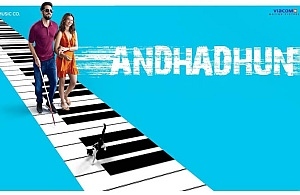 ANDHADHUN is the story of a creative artist who gets involved in a crime scene. Akash (Ayushmann Khurrana) is a blind piano player based in Pune. While crossing the road, he one day accidentally bumps into Sophie (Radhika Apte), who along with her father runs a restaurant named Franco’s. Impressed with his piano skills, she hires Akash to play at Franco’s. Akash impresses the guests with his performance and also Sophie. Both start a love affair. A frequent customer at Franco’s is yesteryear actor Pramod Sinha. He has retired from films and is now into real estate. Three years ago, he married Simi (Tabu), who is his second wife. He has a daughter from the first wife, Dani. Pramod loves Akash’s performance and is also moved by the fact that he is able to recognize Pramod by his voice. It’s his marriage anniversary the next day and he asks Akash to come to his house for a private concert for him and Simi.